Researchers at the University of Bath have used nature for inspiration in designing a new type of swimming robot which could bring a breakthrough in submersible technology. Conventional submarine robots are powered by propellers that are heavy, inefficient and can get tangled in weeds. In contrast ‘Gymnobot', created by researchers from the Ocean Technologies Lab in the University's Department of Mechanical Engineering, is powered by a fin that runs the length of the underside of its rigid body; this undulates to make a wave in the water which propels the robot forwards. 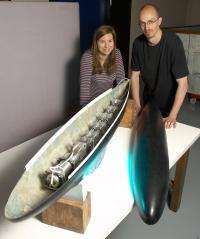 The design, inspired by the Amazonian knifefish, is thought to be more energy efficient than conventional propellers and allows the robot to navigate shallow water near the sea shore. Gymnobot could be used to film and study the diverse marine life near the seashore, where conventional submersible robots would have difficulty manoeuvring due to the shallow water with its complex rocky environment and plants that can tangle a propeller. Dr William Megill, Lecturer in Biomimetics at the University of Bath, explained: "The knifefish has a ventral fin that runs the length of its body and makes a wave in the water that enables it to easily swim backwards or forwards in the water. "Gymnobot mimics this fin and creates a wave in the water that drives it forwards. This form of propulsion is potentially much more efficient than a conventional propeller and is easier to control in shallow water near the shore." Keri Collins, a postgraduate student who developed the Gymnobot as part of her PhD, added: "We hope to observe how the water flows around the fin in later stages of the project. In particular we want to look at the creation and development of vortices around the fin. "Some fish create vortices when flicking their tails one way but then destroy them when their tails flick back the other way. By destroying the vortex they are effectively re-using the energy in that swirling bit of water. The less energy left in the wake when the fish has passed, the less energy is wasted. "It will be particularly interesting to see how thrust is affected by changing the wave of the fin from a constant amplitude to one that is tapered at one end." The lab was recently awarded a grant to work with six other European institutions to create a similar robot that reacts to water flow and is able to swim against currents. In addition to studying biodiversity near the shore and in fast-flowing rivers, robots like Gymnobot could also be used for detecting pollution in the environment or for inspecting structures such as oil rigs. The project was funded by BMT Defence Services and the Engineering & Physical Sciences Research Council. This one needs a movie, or at least an animated image. What ever happened to the idea the Japanese were working on, of a sub where the propulsion was acting on water running in a tube through the middle of the structure? If the fin idea is efficient, seems that the internal "wave" action would be even more so. since nature is always smarter than us so far, why not make a "swimming" sub? I guess a swimming keel is a good start.